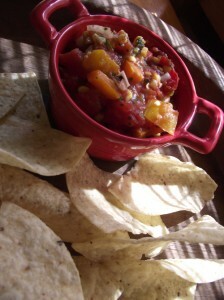 This salsa recipe is so easy that you will wonder why on earth you ever went with store bought salsa!!!! If you don’t have a BBQ or you’re in a rush you can skip the “fire roasted” part. It does give it a really nice smokey flavor when you put a little char on everything, but it will be delicious no matter what. I also use canned tomatoes which I prefer for this recipe but if you have an abundance of fresh ripe ones go ahead and use those instead. If you are not going to roast the veggies before you throw the salsa together you can skip right down to the next paragraph. If you are roasting, just place the whole onion, jalapeno, peppers & cooked corn cob on a hot grill and turn frequently until they are nicely charred. Allow them to cool.